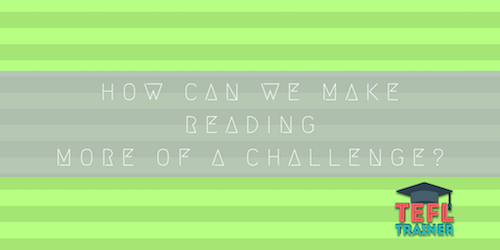 HomeAll postsGeneralHow can we make reading more of a challenge? Reading lessons can often become monotonous, boring and tedious. When the student simply has the task of reading a text, apart from pronunciation correction the teacher often has little input. This is unproductive and not the best use of time, and I think there are several ways to make a reading lesson more interesting and useful. By adding a challenging element to a task, students are instantly more engaged and motivated to fully understand the given text. The first way to improve a reading lesson is to ask a student to summarise. This can either be at the end of the text in a detailed summary, or after each section/paragraph to break up the text and as a way to check that the student is understanding correctly. From my experience I have learnt that asking the students to summarise small sections is useful as it helps them to engage with the text, if they know that they will have to summarise then they pay closer attention and look for the key points. Summarising is also effective as it means that the student has to draw on their range of vocabulary that lies beyond the text, by asking them to summarise in their own words they have to use their imagination and not simply rely on the text. This is more of a challenge and keeps them more engaged. Another way I’ve found to add a challenge to a reading lesson and make it more interesting is to ask the student to pick the 5 most interesting/important words in the text, encouraging them to choose the words they maybe haven’t seen before or the less common vocabulary. Then ask the student to explain these words so you can check that they have understood them, if they answer with the Spanish translation then say sorry I can’t understand Spanish I need you to explain in English! Then once they have explained, ask the student to write a short story or a script including these words. This encourages the student to use their imagination and practise using vocabulary in a different context from the given text. Through this challenging activity the student would not only improve their understanding of the texts and reading skills, but their speaking and writing skills as well. Through utilising interesting methods to work around the text rather than just reading it, students are more likely to read the text with focus when they have a challenge to face. By using a text as a platform for further activities that improve the students’ other language skills, reading lessons become less tedious and more beneficial to the student.